Have you ever dropped a stack of papers that needed to stay in a certain order? If you had used Word 2016 to number them, putting them back together would be fairly simple. If not, what a frustrating, time-consuming task. Fortunately, Word makes it very easy to number your document pages. And you can choose from a variety of numbering styles and formats. 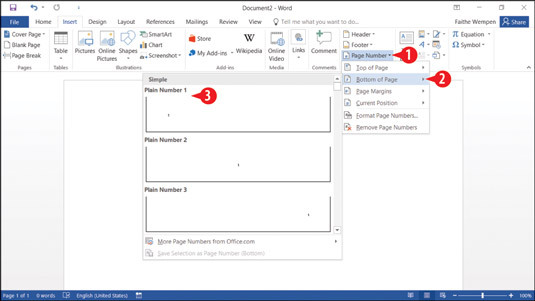 When you number pages in Word, you don’t have to manually type the numbers onto each page. Instead, you place a code in the document that numbers the pages automatically. Sweet! When you use the Page Number feature in Word, it automatically inserts the proper code in either the header or the footer so that each page is numbered consecutively. Page numbers are visible only in Print Layout view, Read Mode, Print Preview, and on the printouts themselves. You don’t see the page numbers if you’re working in Draft view or web Layout view, even though they’re there. On the Insert tab, click Page Number. A menu appears. Point to Top of Page or Bottom of Page, depending on where you want the page numbers. A submenu appears. Click one of the presets. The document enters header/footer mode, and the new page number appears in either the header or footer. The Plain Number 1, 2, and 3 presets are identical except for the placement of the page number, on the left, center, or right, respectively. Choose a page number position. If you want to further edit the header or footer, do so. Otherwise, double-click in the main part of the document to exit from header/footer mode. In step 4 you can also click Close Header and Footer on the Header & Footer Tools Design tab to return to normal editing. Point to Page Margins for a selection of presets in which the page numbers appear in the right or left margin area. Point to Current Position for a selection of presets that enable you to place the page number code in the body of the document rather than in the header or footer. Click Format Page Numbers to open a dialog box in which you can select a page number format. Format in this context does not mean font, size or color; instead it means the numbering format, like Arabic numerals (1, 2, 3) versus Roman numerals (I, II, III). Click Remove Page Numbers to remove all page numbering codes.